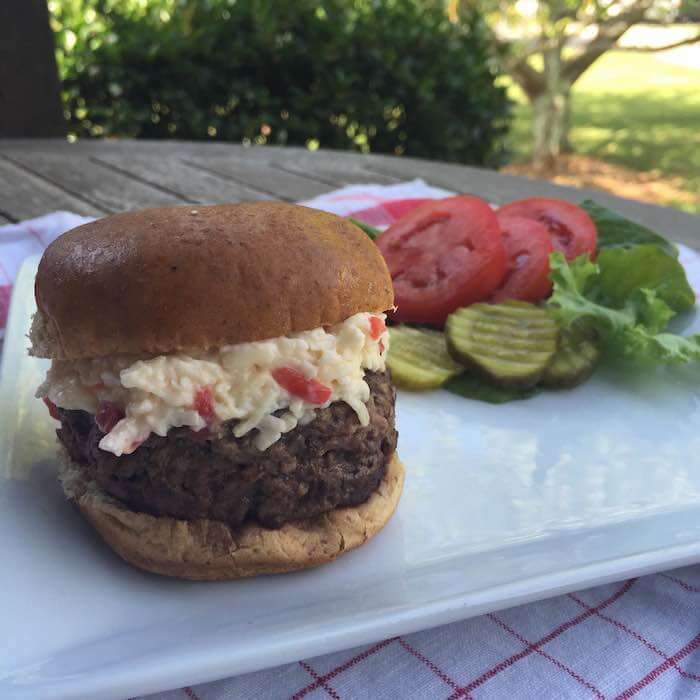 These Pimiento Cheese Sliders dress up your basic hamburger and take it to the next level of yum and are ideal for tailgating or a summer cookout,. I love these baby burgers because they offer so many flavor options. One of my favorite ways to dress sliders lately has been to top them with my creamy LIGHTENED pimiento cheese. When the cold pimiento cheese hits the steamy burger and begins to melt, literal magic happens in my mouth. 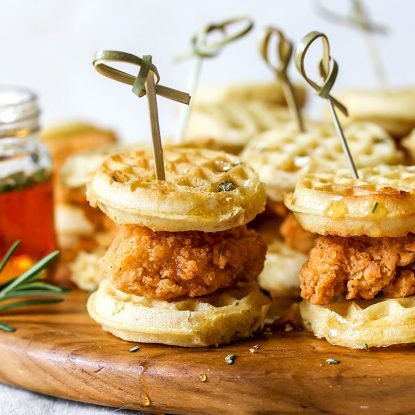 Since this is the first week of college football and many people will be tailgating either at the game or at home, go ahead and add this recipe to your menu–it’s sure to score big points! If you’re into planning ahead, the pimiento cheese can be made ahead and stored in the fridge in an airtight container for up to 3 days. It also can be frozen for up to 1 month so consider making a double batch so you always have some on-hand. Burgers can also be shaped into patties so they’re ready to throw on the grill when it’s time to eat. Because sliders are smaller than traditional burgers, they are often overcooked and can quickly become hockey pucks! I like to form my burgers into a 1-inch patty and then indent the center with a thumb print. This keeps them from turning into little baseballs. Also, make sure to use a meat thermometer so when the burger reachers 160 degrees, they’re ready to be taken off. This recipe uses my simple Lightened Classic Pimiento Cheese. Use this link to get the recipes. Combine ground beef, garlic, salt and pepper in large bowl, mixing lightly but thoroughly. Lightly shape into eight thin mini-patties. Add patties; cook 5 to 6 minutes or until instant-read thermometer inserted horizontally into center registers 160°F, turning once. Place burgers on bottoms of buns. Top with 1 tablespoon [url:1]Lightened Classic Pimiento Cheese[/url]and other desired toppings. 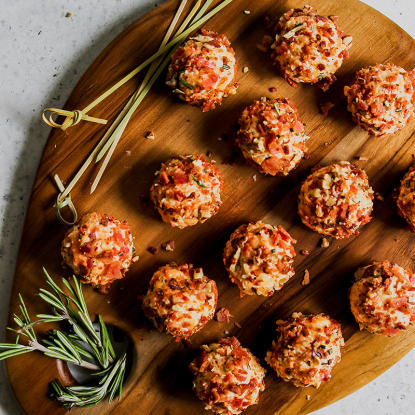 Ideal for tailgating or a summer cookout, these Pimiento Cheese Sliders take your basic hamburger to the next level. Top hot sliders with creamy Lightened Classic Pimiento Cheese, bacon, and your other favorite toppings. I love homemade burgers and these ones are lovely and simple but sound really tasty. I really have to get myself a meat thermometer too. I actually made little burgers last night and my husband dared to complain they were a little overcooked! I meat thermometer makes such a difference. I’ve been one to go on look and feel when testing to see if meat is done but a thermometer gets it right every time. It is worth making the switch! 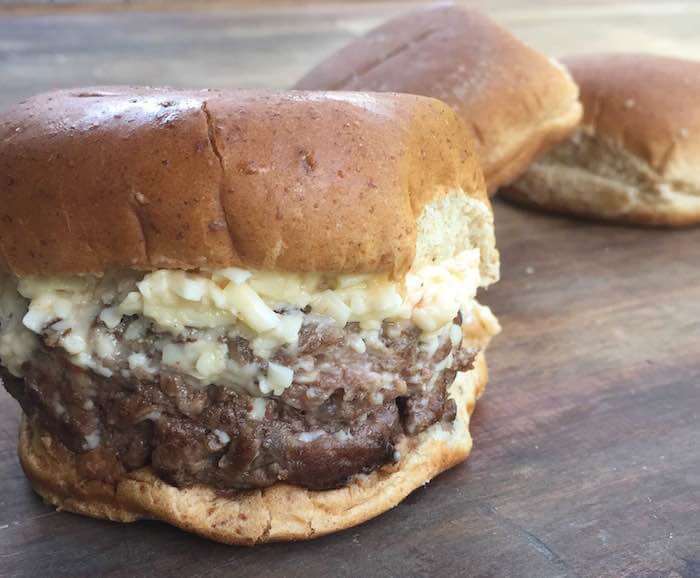 I’m already hooked on your lightened version of pimento cheese…now on a burger? YUM. Oh I’m loving these sliders! Pimiento cheese is a favorite of mine and I always crave it for football games for some reason 🙂 Genius topping a burger with it! Thanks, Aggie! 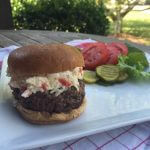 The cold pimiento cheese on a hot burger can’t be beat!